Francophiles be warned, I will be sprinkling this post with little gems of my very rusty high school French. It may be a mistake on my part, but the seed’s been planted and I’m headstrong on being a little Parisian for this post. Here we go. I find myself à la salle de cinéma quite often. 2011-2012 is definitely my year at the movies. There is this charming little creperie a few doors down from the Coolidge Corner Theater, a theater I frequent more than others. Before we dive into the crepes, let’s quickly talk about the Coolidge Corner Theater. Not only does this place have that iconic neon sign, it also has popcorn with REAL butter. You have to eat it quick and I will tell you why. The butter tends to chill and you’re left with cold, wet popcorn. I’d wrongfully given Mr. E a hard time about this because I was convinced his method of eating (mouth into bucket) resulted in the wet popcorn. It wasn’t until I got my own smaller bucket that my world had been shaken. Still wet, oops! The moral of the story – just eat your popcorn while it’s hot. You’ll save a whole lot more face that way. Now back to Paris Creperie. This place est sérieusement minuscule. Really. It’s tight in there. There are a lot of bodies, especially pre- or post- movie. You literally need to box people out to grab a table. The whole situation reminds me a lot of the mall food court the week before Christmas. Your best bet is to find two people hogging a 4+ person table and plant yourself. Despite it’s small quarters, this place has an extensive menu that includes a whole rundown of sweet and savory crepes. I happen to be a sucker for crêpes sucrées (I’m my mother’s daughter) and I always go with a wheat crepe with Nutella and sliced strawberries. I can’t say I haven’t been curious about some of the savory “Provence” crepes, namely the Tuscan (Basil infused with goat cheese, chicken, tomatoes, mushroom, artichokes, olives, marinara sauce, & spinach) and the Smoked Salmon (Scallion infused with smoked salmon, cream cheese and capers). Curious indeed, but I know myself too well. I’m a creature of habit. I may never shake that strawberry Nutella combo. I’m mesmerized by anyone using those wooden T shaped spreaders, so when it’s not especially cramped I like to watch the crepe masters do their thing. I will throw out a disclaimer that I’m no crepe expert, if my use of the term ‘wooden T shaped spreader’ didn’t give it away. I’ve made a few crepes in my day and when they’re tough and look like tortillas, I know they’re bad. Paris Creperie’s crepes are thin, delicate, with a very slight crisp on the outsides. 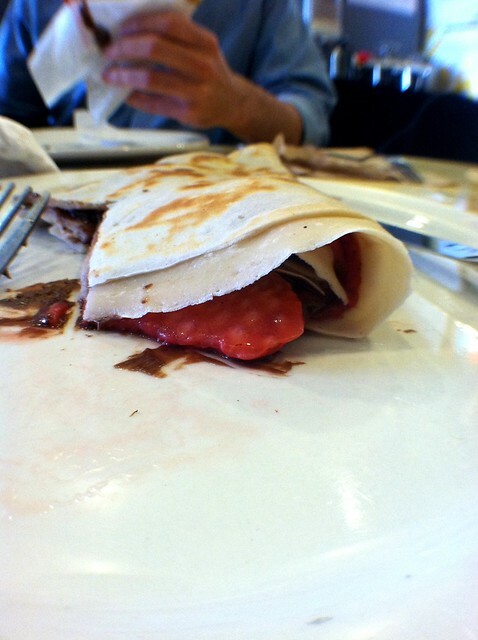 The crepe comes out folded into a quarter and is stuffed with warm Nutella and sweet strawberries. I typically inhale mine and share whatever I have left over with Mr. E because another situation I find myself in is that we’re usually running late to our movie. They are perfectly sweet and brightened with the fresh strawberries. I can’t think of a more delightful light snack before a good movie. Bon appetit et au revoir! Wait. I’m confused. How do you eat your popcorn if not straight out of the bucket? 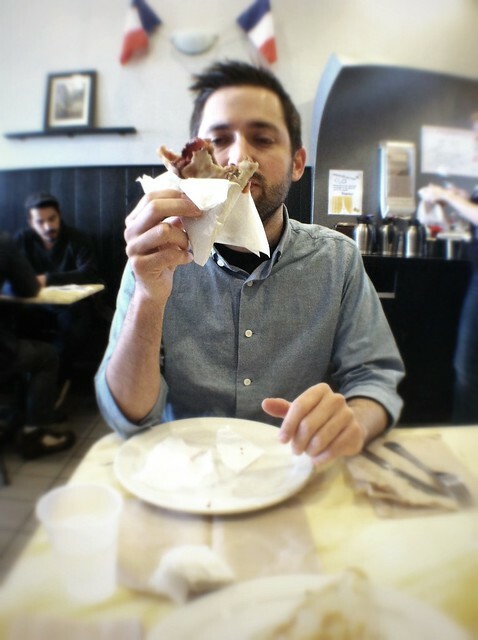 Also, mmm…crepes! Next time you’re back on Long Island, you should check out this crepe place in Long Beach (Aly can give you directions). Haha I should clarify… mouth into the bucket. And noted! Mr. E is so into the crepes, that would be awesome to have a good spot on the island. I’m familiar with both the Paris CrÊperie and the Coolidge Corner Theater. What caught my eye was the photo of the theater – great shot, I’d love to know how you got it. Also, I thought it was a well written review. Thanks man. I took the photo with Instagram, actually. The convenience of iphoneography.